Rare mummies of scarab beetles were among the grave goods found in the Fifth Dynasty necropolis of Saqqara in ancient Egypt, archaeologists in Egypt said Saturday. 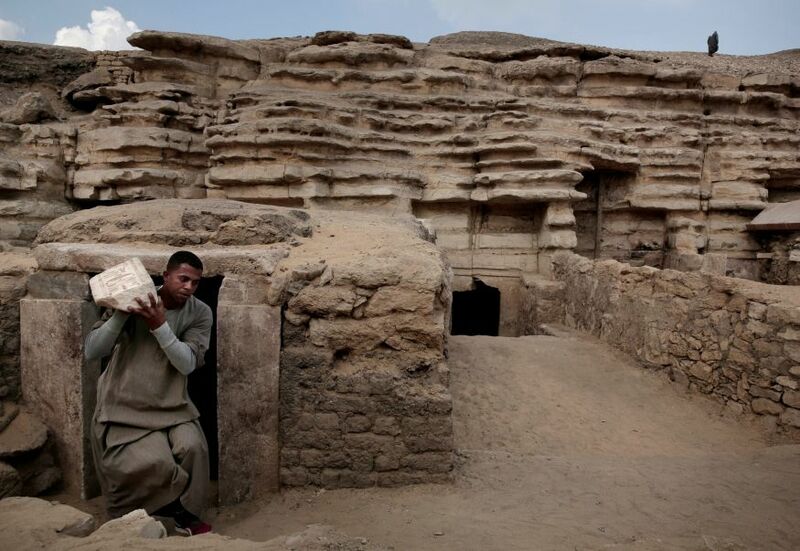 The excavators also said they have found what may be a pristine tomb from the time – around 4,500 years ago – that remained undetected and untouched by grave-robbers all these thousands of years. The tomb dates from the Fifth Dynasty of the Old Kingdom and is unusual because the facade and door are intact, meaning its contents may still be untouched, said Mohamed Youssef, director of the Saqqara area. He said experts plan to open the tomb in the coming weeks. 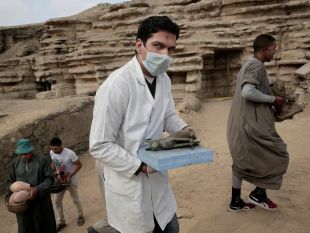 The archaeologists noticed the unknown tomb’s door as they were preparing the site to present the latest discoveries, Mostafa Waziri, secretary-general of Egypt’s Supreme Council of Antiquities, told reporters, Reuters reports. As for scarabs, the real ones exist on all continents except Antarctica, and beetles made of stone have been crawling all over the Middle East for millennia. Numerous ones have been found in Israel, too – for instance, at the biblical cities of Gezer and in Shimron. But finding carefully preserved beetle corpses from 4,500 years ago is something else entirely. The mummified beetles, crocodiles, cats and other sacred animals were among the discoveries in seven tombs discovered over the past six months on the edge of the pyramid complex dedicated to King Userkaf at the necropolis of Saqqara, south of Cairo. 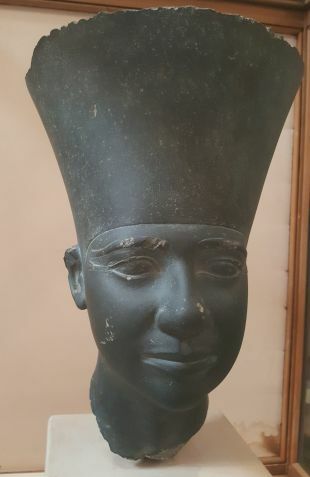 Little is known about the pharaoh Userkaf (also known in Greek as Usercherês), who, according to ancient records, founded the Fifth Dynasty – which is thought to have stretched between 150 to 250 years, depending on which ancient historian one favors. The Fifth Dynasty seems to have begun in roughly the 26th or 25th century B.C.E., around 4,500 years ago. It was part of what historians call Egypt’s “Old Kingdom,” though it was so long ago that even in antiquity, historians argued about who ruled when. The mysteries surrounding King Userkaf himself are legion, including who exactly his parents and queen were. It isn’t even clear where he ruled from. Ancient sources refer to the island of Elephantine as the center of rule, but archaeologists have found palatial ruins in ancient Memphis, some 20 kilometers (12 miles) south of Giza. It is clearer that it was under Userkaf’s scepter that the god Ra rose ascendant. The pharaoh had temples built to this solar deity and it was during the Fifth Dynasty that he became Egypt’s “official” god. And when this short-reigning pharaoh died – apparently leaving behind at least the son who would succeed him, Sahure – Userkaf received the respect due to the deceased king in the form of a pyramid complex in Saqqara. 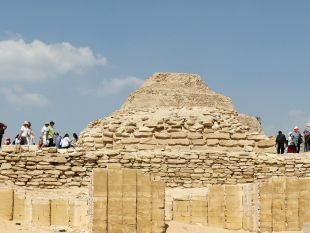 Further strengthening Memphis’ case as the hub of rule, Saqqara was its grand necropolis. That is where the mummified scarabs and other animals were found. 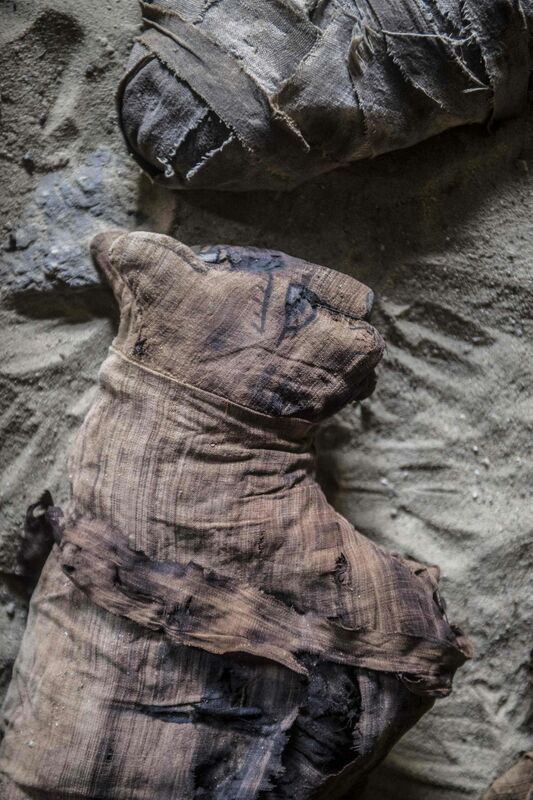 Why did the ancient Egyptians mummify anything? Regarding their own bodies, they believed in an afterlife, though the details of how they thought the embalmed body would serve them remain opaque. However, the mummification of animals is more arcane and apparently stemmed from a wider range of motives – the simplest one being to preserve, cherish and honor the memory of a beloved pet. More were offerings to the gods, though. In fact, far from necessarily adoring the animals, tens of millions, at the very least, were killed and preserved to be offered to deities. Some eight million dogs were discovered in a catacomb near Memphis, to give just one example. 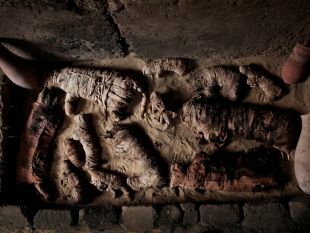 Going by the sheer numbers of preserved animal corpses in over 30 Egyptian catacombs, estimated at over 70 million, packed like library books floor to ceiling, it seems the embalming of Animalia was a vast industry. So, rare this discovery at Saqqara was not. But mummified beetles were unusual. 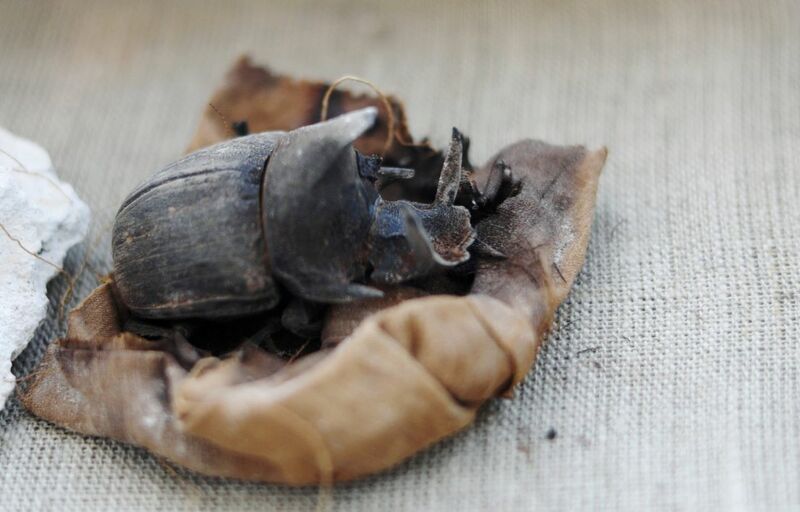 Two large scarabs wrapped in linen and in very good condition were found inside a limestone sarcophagus with a vaulted, decorated lid, the antiquities ministry stated. 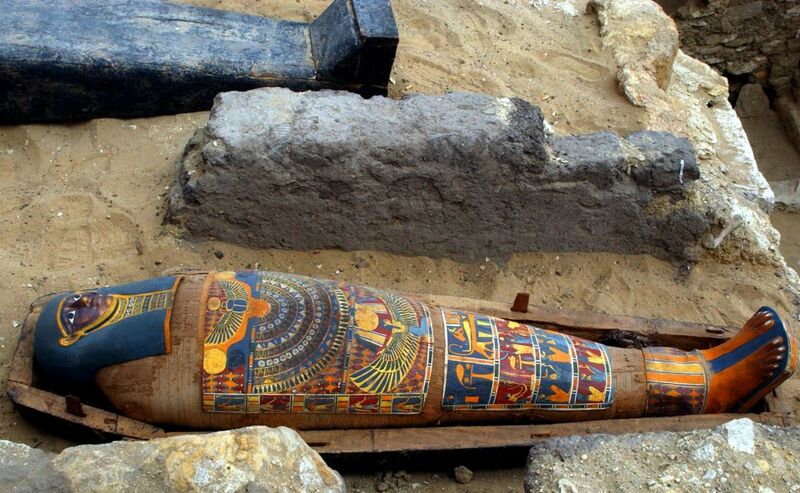 Another collection of scarab mummies was found inside a smaller sarcophagus. Like many of its insect brethren, scarabs are quite revolting according to modern mores. 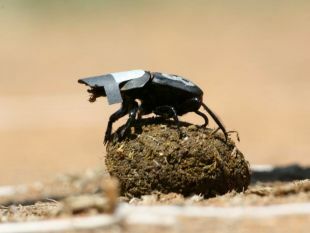 Dung beetles are one subset of scarabs; Tel Aviv throngs with them everywhere street cats do their business. National Geographic describes another type that subsists on snail slime. Though some scarab beetles are quite beautiful in life, with iridescent chitin, their lifestyle is less attractive as most are scavengers. Yet the ancient Egyptians venerated the insect for centuries on end – as early as the Fifth Dynasty, it now appears. The esteem apparently spread around the region: Scarabs carved of stone have been found wherever the ancient Egyptians conquered. The Saqqara tomb also yielded dozens of cat mummies and gilded statues of cats, as well as a bronze statue dedicated to the cat goddess Bastet, as well as painted wooden cobra and crocodile sarcophagi, a collection of gilded statues depicting animal features, as well as objects including amulets, canopic jars, writing tools and papyri baskets. Apropos the crocodiles, last year archaeologists found mummified cats and crocodiles at another remarkable site, Gebel el Silsila – a site on the Nile 65 kilometers north of Aswan. The site had a great many stone scarabs, which is very much the norm, but there is a question about the crocodiles. Thing is, this site is right on the mighty river, which is famously thronged with the great reptiles. 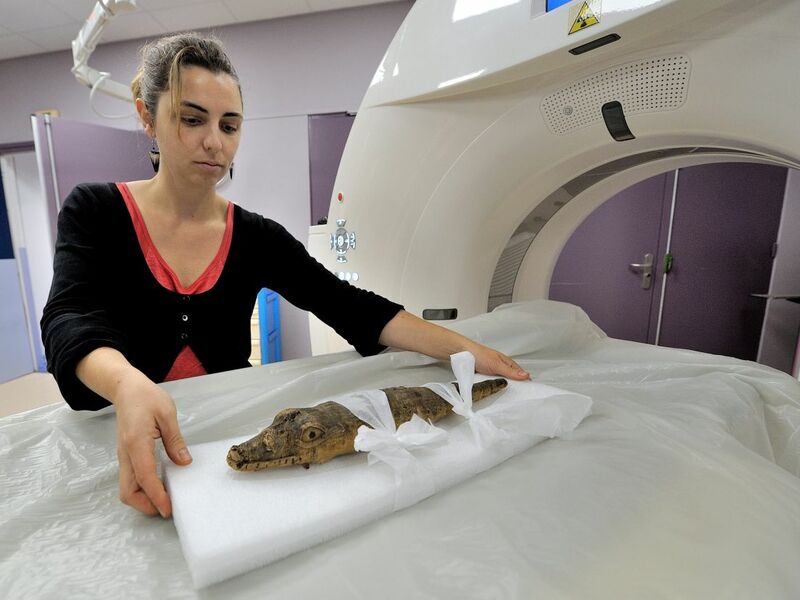 It is entirely possible that the crocodile remains found there were not deliberately buried with great honor, but ended up there with seasonal flooding of the Nile and died, to be found 3,500 years later and, possibly, misinterpreted.